There’s no denying that choosing an engagement ring can be intimidating. It will probably be among the biggest purchases you’ve made in your life thus far, and possibly your first time shopping for fine jewelry. To help you select a stunning, high-quality ring for comfortably within your budget we’ve assembled some little-known facts about engagement ring value. Use one or more of these strategies to select her dream ring and still have money leftover to fund your future dreams as a couple. Round diamonds make up about 75% of all diamonds sold and because they’re so popular, as well as because of the way they are cut, round diamonds cost more than other shapes. If you choose a shape other than round you can save as much as 40% on a diamond of the same quality. 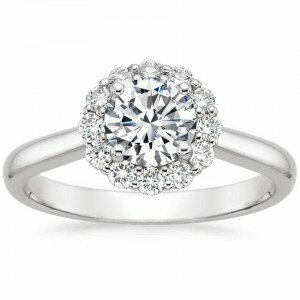 If you like the curved edges of round diamonds, consider an oval instead. 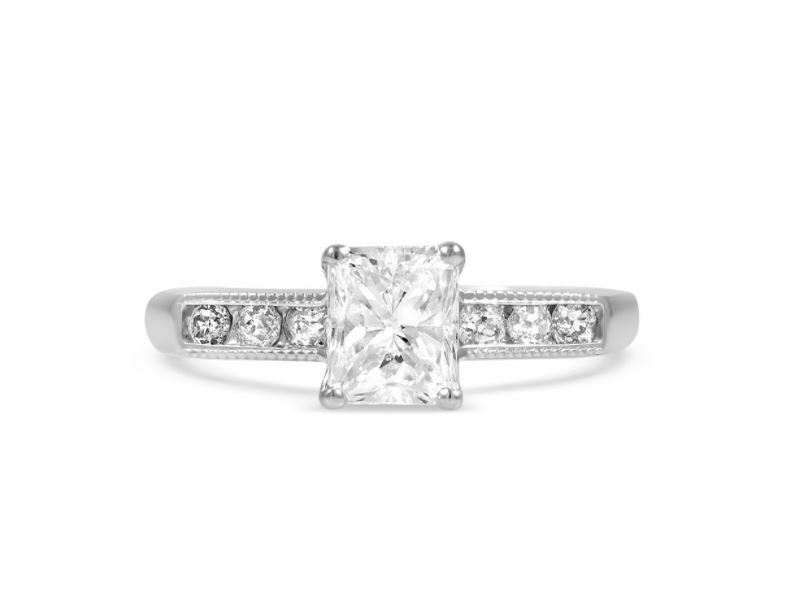 Square diamond shapes, including princess cut (which has crisp angled corners) and cushion cut (which has gently tapered edges) are both very popular and traditional alternatives to round. Next to diamonds, sapphires are the second most popular center gem for engagement rings, and make a great choice for everyday wear. (Sapphires rank 9 on a 1-10 mineral grading scale called the Mohs scale of hardness.) 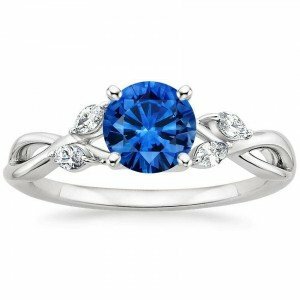 Sapphires cost significantly less than diamonds, which means you can get a larger gemstone for your budget. In addition to deep blue, sapphires are available in almost every color of the rainbow, including shades of yellow and pink that resemble fancy colored diamonds. Our sapphire engagement rings are available with blue, yellow, and pink sapphires as standard options, and you can find other gorgeous hues in our collection of unique colored gemstones. Lab created diamonds share the same chemical and optical characteristics as natural diamonds, so much so that even expert gemologists need special equipment to be able to identify their origins. The only difference you’ll notice is price–lab diamonds cost about 30% less than naturally mined diamonds. And because they require no new mining, lab diamonds are a very eco-friendly choice. 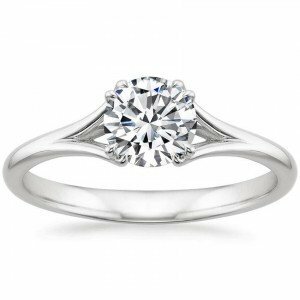 Platinum and white gold are the most popular precious metals for engagement rings, probably because of their clean and classic appearance. But while few people can tell the difference between platinum and white gold, platinum costs about 50% more. Platinum is more durable, but white gold offers significant savings and is durable enough for everyday wear. Although less common than white gold, rose and yellow gold are both very classic, beautiful choices with the added benefit of enhancing a diamond’s color to make it appear more bright white. Diamonds are given a color grade, with grades D, E, and F being the closest to the “colorless” ideal and also the most expensive. Although it depends on the individual gem, a diamond with a slightly lower color grade (say, G or H) can appear close to colorless when paired with a rose or yellow gold setting. Diamond prices increase exponentially with size, so a ring setting featuring lots of glittering diamond accents can have a very luxe look for a surprisingly gentle price. 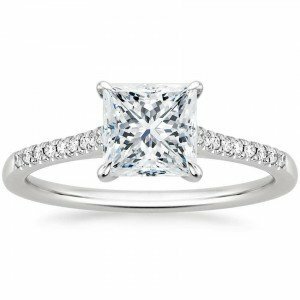 For example, a halo engagement ring, which features a center gemstone encircled by diamond accents, makes the center diamond appear larger than it is. This is also true for other settings featuring many accent diamonds, and for settings with eye-catching details such as hand-engraving, filigree, or milgrain. The antique and estate rings in our extensive collection of vintage engagement rings offer an exceptional value when compared to new rings of comparable size and quality. Hand chosen for their high quality, our vintage rings are often one-of-a-kind and make a perfect choice for a woman who loves the style, art, music, or literature of earlier eras. They are also a very ethical and eco-friendly choice, since no new mining goes into their creation. There are many dazzling rings that do not feature a prominent center gem, and therefore cost significantly less while offering the timeless beauty and symbolism of diamonds. 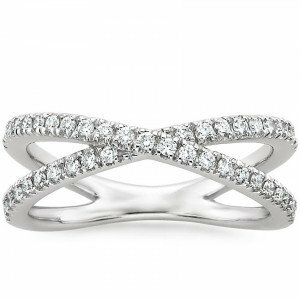 Some stunning examples are the Quintessa Diamond Ring and the Entwined Bisou Diamond Ring. For more extensive education about diamonds, engagement ring styles, and how to find a ring that has been ethically sourced, consult our comprehensive Engagement Ring Guide. 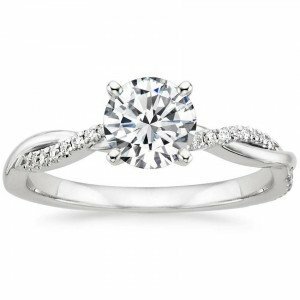 Regardless of your budget, when you are selecting an engagement ring choose a reputable, trustworthy jeweler to guide you. Brilliant Earth has a completely personalized approach to jewelry, and we would love to assist you in this exciting endeavor. Just contact us to discuss or to make an appointment at one of our showrooms. Thanks for providing such a valuable information about engagement rings these are quite helpful. Thanks for providing such a great ideas its very helpful and amazing. I had no idea about all the different shapes, cut, color and carat until I got my wife her ring. As you mentioned round diamonds are the most common so those will be easier to find. Thank you for these steps. I would of liked to have known these before getting my wife’s ring. Hi Alex, we currently do not have any rose colored diamonds available, but our jewelry specialists can often source special gems upon request, or provide similar options. They can answer your questions in more depth via email (http://www.brilliantearth.com/contact/) or at 800.691.0952. Thanks for your interest! This is a well-explained article, Celeste! 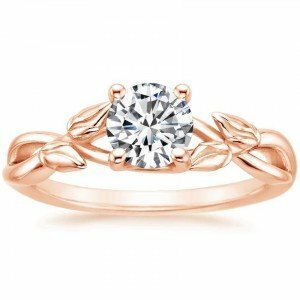 I’m thinking about proposing to my girlfriend soon, and I think she would really enjoy a rose colored diamond. Do you have any information on how much those diamonds would cost? I don’t have a budget—I want her to be mesmerized into saying yes!